Today there are only six cartridges used in rifle-calibre machine guns in the world's major armies: the 7.62x54R Russian, 7.62x51 NATO, 7.62x39 Russian, 5.45x39 Russian, 5.56x45 NATO and 5.8x42 Chinese. 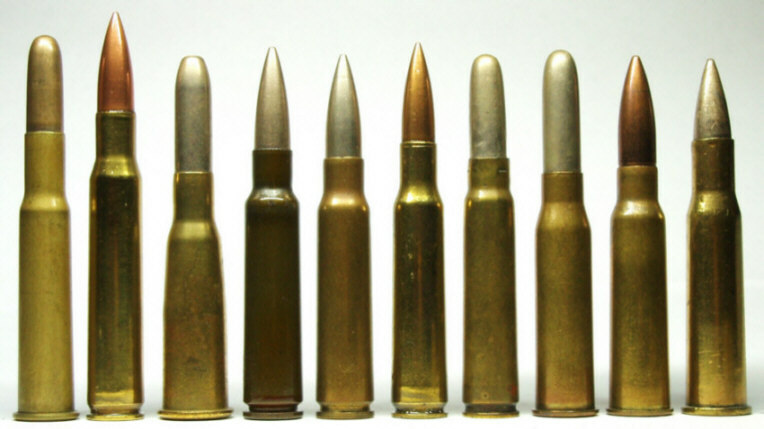 Of these, only the first two are traditional "full power" rounds, a type which until World War 2 was used in almost all rifles and machine guns. Yet during the 20th century many different full-power rifle-calibre cartridges were developed and used in machine guns, and this article describes the ones which saw significant military service. The definition of "machine gun" can be stretched to include the Gatling and the other manually-cranked repeaters which were developed during and after the period of the American Civil War. However, this article will be focusing on the small-calibre high-velocity rounds which entered service in recoil or gas-operated machine guns from the last decade or so of the 19th century. The first of these guns was the famous Maxim which was first adopted by Italy and Austria in 1887, used by many nations, and redesigned and improved in the UK (Vickers), Germany (MG 14 Parabellum), Russia and Switzerland. The Maxim was offered in a wide range of calibres to suit the national preferences of its purchasers, as were other widely popular machine guns such as the Madsen (from 1904), Schwarzlose (1905) and the interwar FN-built Brownings. Other much-exported guns, particularly the Hotchkiss models (the first of which was adopted in 1897), were more often sold in their original calibres. It is worth noting that a few of the older manually-cranked guns were adapted to use the modern smaller-calibre ammunition. Conversely, some of the older black-powder rounds were updated with smokeless powder, chambered in modern MGs and remained in use until after World War 1. These included the French 11x59R Gras rifle cartridge which was loaded with incendiary bullets and chambered in Hotchkiss and Vickers MGs for shooting at hydrogen-filled observation balloons and airships during the Great War. The British Royal Navy also retained Maxim machine guns in a cordite-loaded version of the .45 inch Gardner-Gatling calibre until after that war. These were rare exceptions. By the beginning of the Great War, most major armies had switched to using the new small-calibre rifle rounds in automatic machine guns. These mainly fell into two groups: 7-8mm and 6-6.5mm calibre. Those developed in the 19th century and the very beginning of the 20th were initially loaded with heavy round-nosed bullets, after which lighter spitzer (pointed) bullets, fired at higher muzzle velocities, were introduced. Most of the earlier cartridges were then modified to use spitzer bullets (in some cases the opportunity was taken to alter the cartridge dimensions as well), but a few retained only round-nosed bullets until the end of their service lives, the best-known of these being the Italian 6.5mm Carcano. Of the 6-6.5mm group, the US Navy's 6mm Lee had the smallest calibre to see service until the 1960s, although the cartridge case was relatively large. It dates back to 1895 and was really ahead of its time, as propellants available then could not extract the potential of the cartridge, which developed a muzzle energy of less than 1,650 ft/lbs. The only MG chambered for it was Browning's first service design, the Colt Mk 1 (also known as the M1895 and, more popularly, the "potato digger"), and the cartridge was replaced twelve years later by the US Army's .30-06 round. The other rounds in this group were all of 6.5mm calibre and broadly comparable in size and power; the Japanese 6.5x50SR Arisaka (round-nosed Type 30 adopted in 1897, Type 38 spitzer loading in 1905), Italian 6.5x52 Carcano (1891), Dutch/Romanian 6.5x54R Mannlicher (1892), Greek 6.5x54 Mannlicher-Schönauer (1903) and Swedish 6.5x55 Mauser (1894 – also used by Norway, Denmark and Luxembourg). All of these developed around 1,800-2,100 ft/lbs muzzle energy. Of these, the 6.5x55 was the biggest, most powerful and most long-lived, and remains a popular round for commercial hunting rifles. The larger calibre group showed a little more variety in performance, typically developing muzzle energies in the 2,200-3,000 ft/lbs range in the later spitzer loadings. The dominant rounds throughout this period were the German 7.92x57 first developed in 1888 as the "Patrone 88/8", although modified to take a spitzer bullet ("S-Patrone") of slightly larger diameter in 1905, the British .303 inch (7.7x56R) of 1889 (the round-nosed bullet replaced by the Mk VII spitzer ball in 1910), the Russian 7.62x54R of 1891 (spitzer loading in 1908), and the American .30-06 (7.62x63) of 1906. The spitzer-bullet .30-06 replaced the slightly longer .30-03 (7.62x65 with a round-nosed bullet) of 1903 which had in turn replaced the .30-40 Krag (7.62x59R) of 1892. Of these, the 7.92mm Mauser and the .303 were used by many nations prior to and during World War 2, the .303 even by Italy and Japan as a consequence of interwar exports of Vickers and Lewis aircraft MGs. The 7.62x54R of course remains in front-line military service in Russia, China and many other countries to this day, while the 7.92x57 and.30-06 cartridges are very popular in hunting rifles. These were supplemented by many other cartridges, however: it appeared to be fashionable for each nation which could afford it to have its own unique rifle/MG round. In addition, some "rifle calibre" rounds were specifically developed for machine guns. The French 8x50R Lebel was actually the first modern smokeless-powder round to be adopted, with the flat-nosed "Balle M" bullet in 1886, and in 1898 also introduced the first military spitzer loading, the famous solid brass "Balle D", which was also the first to have a boat tail. It was replaced in service by the short-lived 7.5x58 in 1924 before that was in turn replaced by the slightly modified 7.5x54 Model 1929 five years later, to reduce any confusion between the 7.5x58 and the 7.92x57. The new cartridge was, however, very similar to the Swiss 7.5x55 adopted in 1911 with a boat-tailed spitzer bullet to replace the earlier round-nosed 7.5x53 of 1889. The 7.5x54 remained in French service until replaced by the 7.62x51 in the 1970s, while the 7.5x55 is still in Swiss service and is available in military and hunting loadings. The German-developed 7x57 Mauser, a slightly necked-down version of the older 7.92x57, saw service with Spain from 1892, several South American nations and Serbia, in various different machine guns. The 7mm remains a deservedly popular commercial hunting cartridge, being regarded as one of the most useful rounds for anything short of heavy and dangerous game. Another popular military cartridge was the 7.65x53 Mauser of 1889, also known by the names of the principal user countries as the Belgian, Argentine and Turkish Mausers: in addition it was used by some other South American countries. A spitzer bullet loading was not adopted until the 1920s. Despite this widespread military use it has never achieved much popularity as a commercial hunting round. Other rifle rounds to see service in machine guns include the 8x50R Mannlicher first adopted by the Austro-Hungarian Empire in 1886 (and subsequently used by Bulgaria), the 8x52R Siamese Mauser of 1923, and the 8x58R Krag-Jorgensen of 1889 (spitzer bullet loading 1908) used by Denmark, Sweden and Norway. Several nations decided to upgrade the performance of their machine guns by adopting new rounds specifically for them. Most such changes were made in the interwar period, although the Dutch had used their unique 7.92x57R as a special-purpose machine gun round since 1908. The Japanese first adopted the 7.7x58SR in its Type 89 version (in 1929), later replaced by a modified loading, the Type 92: later still came the rimless 7.7x58 Type 99, used in rifles as well as MGs. Norway adopted the 7.92x61 in 1929, Austria, Hungary and Bulgaria the 8x56R Solothurn from 1930 (unusual at that late date for using a rimmed case), Sweden the 8x63 in 1932, and Italy the 8x59 Breda in 1935. In some cases rifles chambered for these rounds were also made, but with the main exception of the 7.7mm Type 99 these were primarily to provide MG troops with commonality of ammunition. In addition, in 1938 the Italians adopted the Breda M38 in their new 7.35x51 rifle cartridge (the 6.5x52 Carcano necked-up to accept a larger, spitzer, bullet), but before the change to the new calibre had made much progress, the Second World War broke out and caused the changeover to be stopped. The end of the Second World War saw most of these old calibres gradually phased out, although some lingered for a few decades. 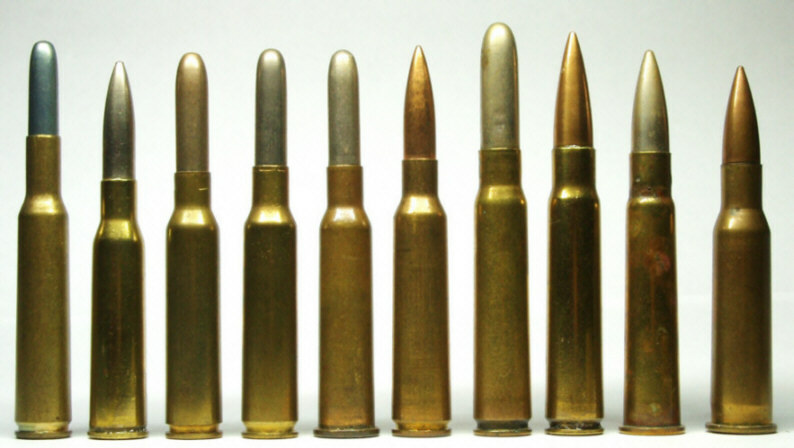 New "intermediate" cartridges primarily intended for selective-fire assault rifles were developed, and these were soon used in light machine guns. The two remaining full-power rounds, the old 7.62x54R Russian and the 1950s 7.62x51 NATO, are still extensively used in GPMGs and specialist rifles and look as if they will continue in those roles for a long time to come. Nearly all of the rest have either vanished into history or, in a few cases, are surviving by virtue of their popularity in hunting rifles. The table below shows service rifle-calibre machine gun ammunition, together with the MGs it was mainly fired in. The measurements given are indicative, and showed some variation especially in the earlier rounds. 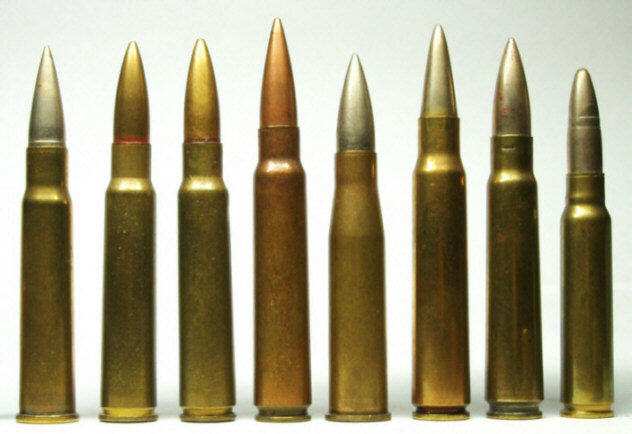 Typical loadings are given, but some cartridges were used with a wide variety of bullet types and weights and muzzle velocities. Round-nosed bullets are indicated by RN after their weight. This article is based on excerpts from the book Machine Gun: the Development of the Machine Gun from the 19th Century to the Present Day, by Maxim Popenker and Anthony G Williams, published by The Crowood Press (UK) in July 2008.